Nuclear Power vs off grid homes and installations. The last ditch nuclear sales pitch. The laws of technology life cycle determine that the role of the electricity grid had a beginning, a middle and will have either a transformation or an end. Probably it will have a transformation, in which heavy power users will be the prime customers dependent upon it. From about the 1880s the grid increasingly grew in importance and sophistication. Power grids traverse most of Australia. But not all of it. For many generations, Australians in the bush have had to be grid independent. Increasingly, as batteries and solar panels both improve and become cheaper, people in cities and towns choose to become largely or totally independent of the grid. As the AEMO has reported, the cost of maintaining and expanding the grid has become more expensive. Due in part to profit taking from overseas owners of much of Australia’s grid network, and also due in part to loss of market due to new energy generation and energy storage technologies at the domestic level and some industrial levels. The trend to cheaper and better solar panels and batteries is now unstoppable, no matter what choices are made in Canberra. People vote for the technologies they want and can best afford. “A report published by the International Renewable Energy Agency, also known as IRENA, revealed the overall costs for residential solar PV systems in Australia (including both installation and operation) had fallen by over 50% between 2010 and 2014, from $US0.35 down to $US0.17 per kilowatt-hour.” Source: How Much Do Solar Panels Cost? at https://www.solarmarket.com.au/tips/how-much-do-solar-panels-cost/ . The cost is cheaper is 2018. The $7,000 to $10,000 cost of storage batteries remains high and falling. And so at the present time, most solar PV homes remain connected to the grid. Then again, about a decade ago a 3kw solar panel installation cost around $10,000 and is now about a third or less than that. The same price reduction, along with improvement in battery technology might reasonably expected in relation to batteries over the next ten years. “The Australian energy system stands as a monument to vested interests. It is a system controlled by owners who are protected from market forces and state governments content to milk consumers for all they’re worth and more — because the rules allow it. “The operators have spent a lot of money on building their networks to potentially provide excessive reliability,” Craig Memery from the Public Interest Advocacy Centre says. In short, the higher the value of the network, the more income they earn. While politicians of a particularly narrow field of interest bemoan any decentralised form of power generation, use and distribution, the facts remain that the owners of Australia’s poles and wires and transformers and the attitudes of these owners, are key reasons for the current electricity price crisis. Having said that, being an owner of a mere 3kw PV rooftop system (without batteries – yet) I have not had to pay a power bill for over a decade. So the failure as I see it is in the lack of equity and access in the original and current PV system. Renters and the less well off have no access to PV power. And that is unAustralian. None the less. There is a looming grid crisis of under utilisation. It may take 10 to 15 years to fully mature, but it is a threat as the fewer grid users there are, the more expensive it will be to remain connected to the grid. A tipping point will be reached perhaps in 20 years time or so. The energy technology transition cusp at the far side will hold many challenges for traditionalists. What to do with “baseload” generators. What to do with poles and wires, increasingly abandoned by ordinary consumers and many industrial users as well. This journey will, I think, take 20 to 30 years. AEMO, the national electricity market organisation, has already raised the issue of loss of market share suffered by the national grid. It has raised concerns already at the rise in costs per remaining customers. It’s the story of lighting kero vs Edison and Westinghouse all over again. In my opinion. Some people still use kero lighting, but most do not. Such is the technology life cycle. All things must pass. Nuclear Industry, Baseload and the depopulation of the Grid. When the Lord ladled out brains, perhaps I got one scoop and Mr. Brook and Mr Heard (for they are laymen, like me, in this field), may very well have gotten 42 scoops. Big deal. The designers of the Titanic were genius level, it was said, before the boat sank. Surely a rough calculation on the future sales opportunities of nuclear power in Australia will produce a time frame beyond which hope is lost. The window is closing. Unit cost of power in Australia is related to the cost of the grid, the cost of generation and periodic varying demand. Australia has invested poorly in the past. Most of our coal fired stations are old. Nearly all, if not all of them, fail to meet world best specs. They are out of date. A perfect opportunity for the nuclear industry to market and advertise its wares. The industry must realise it has no more than 5 years in which to convince all Australians that we must give social licence to the nuclear industry. From 1945 until 2018 however, whenever Australians have been asked, we have said no to nuclear power. Mr Heard has every right to disagree with me and I with him. Medicalising the problem is not the answer Pam, Bobby and the rest of the crew at LANL. The panic of the nuclear industry was and remains palpable in response to the events at Fukushima. Five years to obtain social licence from the people and 15 years to build Australia’s first nuclear power plant. That, I think, is the plan. It’s a tight time line. For in 20 years, the grid will be quite expensive per remaining user. And nuclear power plants MUST BE CONNECTED TO A NUCLEAR SPECIFIED STANDARD GRID. Best of luck of with that one Mr. Heard. Let’s revise the IAEA regulations on that shall we? (is one reactor in Australia going to change the climate?) How cheap will its power be per kw taking everything into account, including its diminished market share by 2038? Does Australia’s Power Grid Meet International Atomic Energy Agency Specifications for Connection to Nuclear Power Plants? 2.16 The study found that the increases in cancer rates ‘do not appear to have been caused by exposure to radiation’.29…..However, the contention was not resolved and Ms Ann Munslow-Davies, the Consultative Forum representative on the Committee, felt, in consequence, that she could not endorse the reports.33″ Source: Report – Australian Participants in British Nuclear Tests at https://www.google.com.au/url?sa=t&rct=j&q=&esrc=s&source=web&cd=4&ved=2ahUKEwjCz7CP5pveAhWIKY8KHdNxADUQFjADegQIBhAC&url=https%3A%2F%2Fwww.aph.gov.au%2F~%2Fmedia%2Fwopapub%2Fsenate%2Fcommittee%2Ffadt_ctte%2Fcompleted_inquiries%2F2004_07%2Fnuclear_tests_bills_06%2Freport%2Fc02_pdf.ashx&usg=AOvVaw2y609Bv2Smh7TohHw3zVk4 direct pdf download from DVA. I guess I should declare I have known Ann Munslow-Davies in the past. I am aware that Ann’s late nuclear veteran father would periodically visit the area where I worked in the Army in the 1970s in order to service the unit’s mass spectrometer. This was in the era of French H bomb testing in the atmosphere. And so the mass spectrometer, apparently, had to be accurate. Ann’s Dad died young. As I understand it, of radiogenic illness. Beyond belief for Mr Howard and the idiots at Adelaide Uni in 2006. Of course Adelaide University was commission by the Howard government to cook these findings up and the statement “‘do not appear to have been caused by exposure to radiation’ by these learned people smacks of a self serving statement. The learned experts being adamant that they knew precisely that which did not cause the grossly excess disease while at the same time being totally innocent and profoundly ignorant of that which did cause the grossly excess disease. And staff at Adelaide Uni go on channel 9 and bemoan the lack of scientific skill possessed by common people !!!!! Six months after the report was published, Howard pronounced the north of the Gulf in SA a darn good place to build a nuclear power plant. A power plant needed to provide the large amount of electricity need for expanded and uranium enrichment. Happily it never came to pass and Howard was last seen blaming instability in the Liberal Party upon everyone but the Liberal Party. Including voters in a democracy. Back to the IAEA. and requirements for a nuclear grid. ELECTRIC GRID RELIABILITY AND INTERFACE WITH NUCLEAR POWER PLANTS” IAEA NUCLEAR ENERGY SERIES No. NG-T-3.8, IAEA, COPYRIGHT NOTICE All IAEA scientific and technical publications are protected by the terms of the Universal Copyright Convention as adopted in 1952 (Berne) and as revised in 1972 (Paris). Reproduced for study purpose and fair use. “The safe and economic operation of a nuclear power plant (NPP) requires the plant to be connected to an electrical grid system that has adequate capacity for exporting the power from the NPP, and for providing a reliable electrical supply to the NPP for safe startup, operation and normal or emergency shutdown of the plant. “Connection of any large new power plant to the electrical grid system in a country may require significant modification and strengthening of the grid system, but for NPPs there may be added requirements to the structure of the grid system and the way it is controlled and maintained to ensure adequate reliability. “The organization responsible for the NPP and the organization responsible for the grid system will need to establish and agree the necessary characteristics of the grid and of the NPP, well before the NPP is built, so that they are compatible with each other. They will also need to agree the necessary modifications to the grid system, and how they are to be financed. 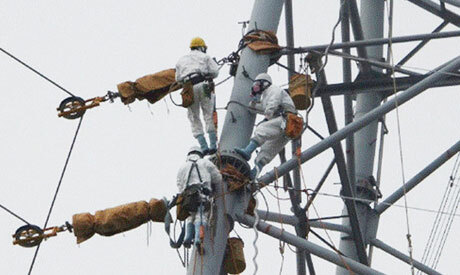 photo from Tokyo Electric Power Co. shows workers attempting to repair power lines at the Fukushima Daiichi Nuclear Power Plant, March 2011. The power grid connection to Units 1, 2, 3 and 4 was destroyed during the earthquake. South Australians and the Canberra politicians who mock this state’s black out in Sept 2016 have all seen the photos of the totally destroyed high voltage power pylons caused by high winds. The US Nuclear Regulatory Commission has much to say about the relationship between core overheat scenarios in the case of grid failure such as occurred in South Australia in 2016. One has to be very loopy to imply a nuclear power plant is a safer option for South Australia than renewable power in the case of major grid infrastructure failure as occurred due to high winds in 2016. It is plainly imagined which lobby groups are the hip camp followers in Canberra at the present time. It’s little wonder Parliament cannot see the future nor respond to present reality in a vaguely non-chaotic, non-denalist fashion. This entry was posted in Uncategorized on October 23, 2018 by nuclearhistory.